New White House communications director Anthony Scaramucci said on Thursday morning that he’s not accusing chief of staff Reince Priebus of being a leaker but said if reporters think he is a leaker, Priebus should defend himself that he’s not the leaker. In other words, he accused Priebus of being behind the leaks. In an early morning interview on CNN’s “New Day,” Anthony Scaramucci, spoke about the latest White House leak, his financial disclosure forms (in actuality it wasn’t really a leak because the disclosure form is a publically availible document). For those who don’t remember their Genisis, Cain, and Abel were the children of Adam and Eve. Cain killed his brother because he thought God liked Abel better. Then he went on to accuse Priebus of leaking again–indirectly but as clear as day. Scaramucci told CNN that reporters thought he was blaming Reince because they know who the source of the leaks is, so they may believe that Priebus is the source. In all probability, this has absolutely nothing to do with leaks and everything to do with a power struggle between the Cheif of Staff and the communications director. When President Trump was first putting together his team Reince Priebus put together a scathing memo recommending the POTUS keep Scaramucci out of the administration. Eventually, Scaramucci was officially added to the team, and what you see now is a power struggle between the two. While many reports claimed that earlier this week when communications staffer Michael Short was pushed out because according to sources he was a leaker, neither Scaramucci or anyone else at the White House confirmed the violation. However, we do know that Short came in with Priebus and his departure could have been part of a purge. But that, like the reports that he was the leaker is pure speculation. 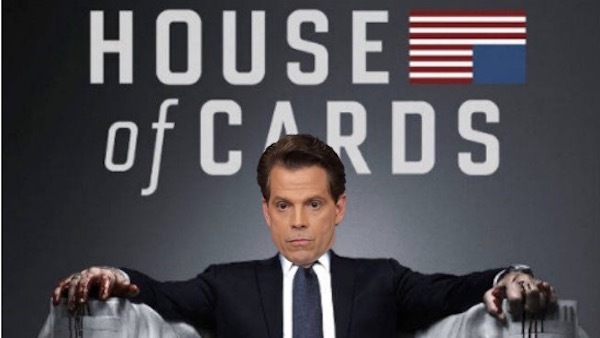 This latest move by Scaramucci is part of a knock-down, drag out, “House of Cards”-like political battle, and based on the past week, Reince Priebus should be very concerned for his job because so far, he is losing. In a few short days, it seems as if Scaramucci is building and consolidating power in the White Housse. And as a very smart business executive, he wouldn’t go after Priebus without the knowledge and consent of the POTUS. In other words, the former RNC chair is being pushed out and don’t be surprised that if/when Reince quits Scaramucci moves into the Cheif of Staff’s office.